Like water and air, there is energy that can be tangible and visible, and although some forces are unseen, we know they exist and both can be directed intentionally. When harnessed properly, each yields tremendous creative power. Just as with our internal energy, one simple adjustment in our surroundings can be all that’s needed to direct vibrating ripples of energy throughout the seen and unseen world, changing momentum, propelling us on to success or into more abundant directions. Literally translated as “Wind and Water,” Feng Shui is the ancient Chinese science and art of managing the physical and unseen energetic environments in which we live and work to support abundance, wellbeing, peace and Living Harmony. With Feng Shui, relieving stress, boosting profits and living healthier more abundant lives is just a fine-tuning away. By creating energetic harmony in your environment, you can better manifest more of what you want including things like love, success, wealth, healthy relationships or even weight loss. Feng Shui helps you power-up the Law of Attraction! How? Just a few simple adjustments in your home or office really can help you feel calmer, more powerful, and open the flow of abundance, magnetizing success to you! Remember, wherever your environment is not supporting you, it's actually either detracting from your desires or in direct opposition to them. You must use your own personal energies, which are often already taxed, to then either make up the difference or push through the barriers. Our environments are said to make up about 33% of our available energies. Why waste all that power, and have to drain the rest of our personal resources as well? Often it's because we either don't know about our environmental energy, or we simply don't know how to manage it. Fighting against our own environments, we often ask "Why can manifesting be so difficult? After all we are putting in tremendous effort, aren’t we?" We are using our conscious minds and our physical force, but we’re so much more than just those two limited resources. Clearly positive thinking or brute force alone often isn’t enough. Using only our conscious minds to create is not only frustrating, it’s foolish. We have a whole universe right in our very homes and offices filled with energy just waiting to be harnessed! Feng Shui not only helps us better manage the unseen energies around us, but perhaps more importantly, it supports our conscious intentions with anchoring visual reminders, keeping all our energies consistently directed at our desired goals. But as some clients began to realize their dreams they reported the seemingly magical transformation of their realities, yet others lamented being frustratingly stuck. Often the most “stuck” clients were the ones who had previously spent thousands on feng shui and self-help programs that didn’t tell them what to do when things were not working resulting in even more frustration and disappointed. I began to ask what I could do to help even the most stuck and unsuccessful client successfully and finally achieve their goals. The answers can now be found throughout this site, and in the stories of my many successful clients who all know that with the right tools we can clear any stuck energy, shift our vibrational frequencies and navigate through our personal storms until we reach a new day, the day in which our dreams unfold in this our present reality. You can begin now with Living Harmony's FREE Feng Shui Tutorial where you'll find a wealth of feng shui references, guides, information and resources. Lucky Cat is both the traditional Feng Shui symbol of abundance and a nickname given to me by one of my clients who after years of “trying everything” was able to finally achieve success with Living Harmony’s unique combination of energy tools. Often when we’re not successfully manifesting what we desire, it’s not the Feng Shui or the visualization that didn’t work, and it’s not that we’re not meant to have what we so dearly want. We have only to learn how to manage all our energetic resources to get ourselves unstuck, which sounds far more difficult than it is, and success can be ours with much less effort and far more grace than ever before. Like moving your hand from the wall to the door to get to the other room, less but more efficient effort will get you better results. Feng Shui strives to bring back the natural order and harmony of our environment, the state in which abundance is the organic experience. When our energies are harmoniously directed in a consistent and conscious manner in the direction of our desires, the ease and grace with which they appear as our new reality really does feel miraculously magical. Though there are unseen forces at work, we really can Tap Into the Power TM...the power of our minds, hearts and our environments to attract to ourselves whatever we desire...in Living Harmony. Living Harmony Lucky Cat Feng Shui Plan. Click here to read Living Harmony: Living Lessons articles about Feng Shui. Click here to read descriptions of actual clients' experiences as they create abundance, wellbeing and a sense of peace with Living Harmony Lucky Cat Feng Shui. © 2015, Cathleen Campbell Stone, Living Harmony. All rights reserved. Does your environment support you or hold you back? If you've been trying to manifest success with little or no success, your space may just be keeping you stuck! 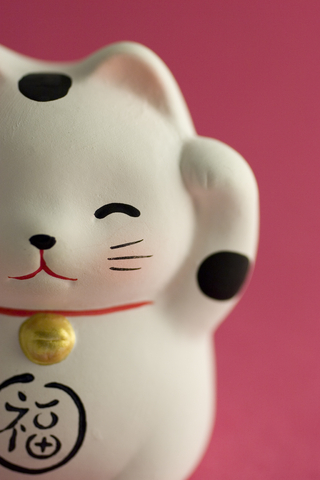 Give yourself a power-boost with Living Harmony Lucky Cat Feng Shui. Click here to shop a selection of my favorite feng shui resources and energy management tools.